I've managed to catch a cold in the summer. At least I think it's a cold and not allergies. Either way, I decided I would take some time and post some reviews because I just didn't post many in August. The front of the box looks like a pool, and on the side they even have some metres listed. Super cute! Skyn Iceland Hydro Cool Firming Eye Gels - I've seen these from Ipsy before and I wanted to try them. I haven't opened this up yet, but I've heard great things about them. Number 4 - Blow Dry Lotion - I haven't been using heat on my hair for a few months now, so I haven't needed to try this yet. I can say though I'm sick of seeing this brand in EVERY box. Amika Nourishing Mask - again, I haven't had a chance to try this. I pretty much wash my hair, let it air dry, and then it goes into a bun. It's been hot and humid, and because of work I have to wear it up. So all these masks and lotions have been kind of pointless for me for now. But I will get to it, I was looking forward to trying this. Laqa & Co Multitasking Crayon - This crayon is supposed to be used on your lips or cheeks. I got the colour "cray-cray" which is a coral peach. This is very orange on me. It does not look nice on me as a lip colour, and I haven't tried it on my cheeks yet. Crabtree and Evelyn Gardeners Ultra Moisturizing Hand Therapy - not a fan of the scent, but its nice and thick and moisturizing. Another hand cream though. How much does a person need? So this box was a hit and a miss. I would have been happy with a different lip crayon (we all got these in our boxes) and I can't wait to try the eye gels. But everything else was meh. We will see how September is. I meant to cancel and I forgot, so this will be the determining box. 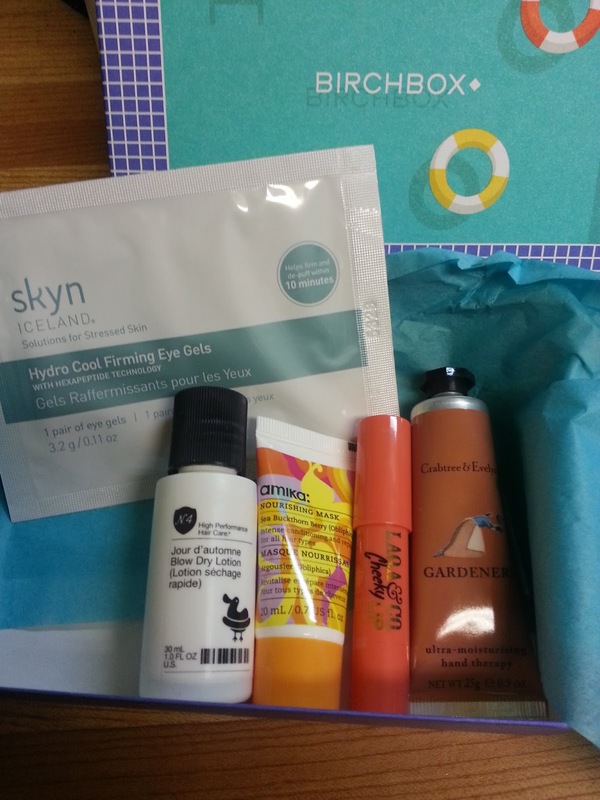 I'm still just not wowed by Birchbox - I think they can do better for Canadians! Did you see that they will no longer be updating their Canadian Instagram account? For sneak peeks they will now be on the US page. People were asking if they were going to stop sending boxes to Canada and they said no. I'm not sure if I will stick around, they have been a little disappointing compared to the US boxes.